Paper penguins are easy to assemble and make lovely craft decorations or greeting card designs. Did you know that Valentine's Day cards often feature penguins? Penguins are one of the few animals in nature that mate for life and are a symbol of love and fidelity. There are two options for making this penguin craft. You can cut the entire paper penguin by hand, or you can download free digital die cut files and cut them on an electronic digital die cut machine. 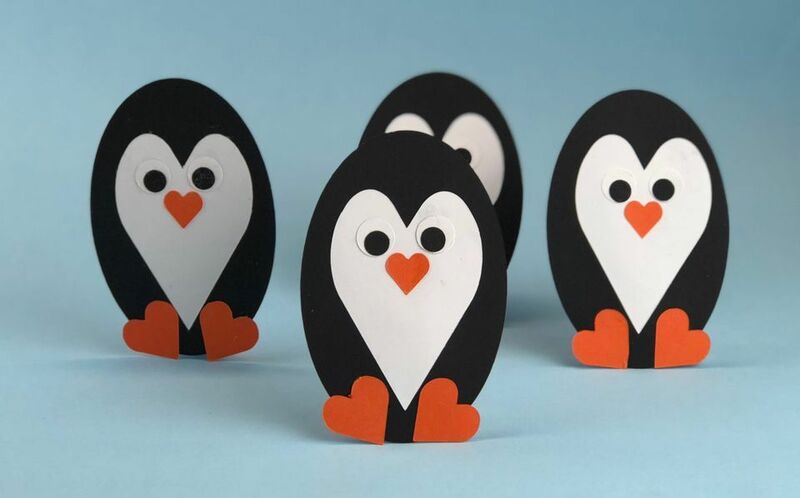 If you use an electronic die cutter, your penguin will have precise, even edges, but it is possible to get a cute penguin by cutting the paper templates entirely by hand with scissors. Most older kids will be able to make paper penguins without difficulty, but younger children might need the help of their parent or teacher. Once you have all of your materials gathered, you should be able to make an adorable paper penguin in less than 30 minutes. Be creative when making these penguin decorations! Experiment with colors. No one says that you can't have a blue, green, or even purple penguin. Let your imagination be your guide! Above all else, make sure to have fun while making these DIY decorative birds. When using an electronic die cut machine, cut a black oval shaped penguin body, a large white heart, two white eyeballs, two black pupils, two orange hearts for feet, and one small heart for the beak. If you are cutting the penguin by hand, print out the PDF template, then cut out the penguin template parts. Lay the template parts onto the appropriate colored cardstock paper and trace around the edges with a pen or pencil. Cut out the penguin parts with scissors. Apply glue to the back of the large white heart and place it onto the oval black paper shape. Press the white paper heart shape down firmly with your hand to assure glue adhesion. Add glue to the backs of the two larger orange hearts and place them at forty-five-degree angles on the bottom of the penguin's body. The large orange paper hearts will be the feet. Add glue to the back of the smaller heart and place onto the white paper heart just below the middle point. The little orange paper heart will be the penguin's beak. Glue the black paper circles onto the white paper circles with craft glue or a glue stick to make the penguins eyes. Paste the eyes in place with craft glue or a glue stick, using the above photo for guidance. Your penguin is now finished and ready to be used as a decorative element on a greeting card, refrigerator magnet, bookmark or as a craft decoration. To make your penguin into a card, grab a piece of letter-sized construction paper. Fold it in half and glue your heart penguin to the front of it. Add an appropriate sentiment by hand with a marker, gel pen or stamp and you are finished!